Rodney Johnson knows parents are the original game changers. 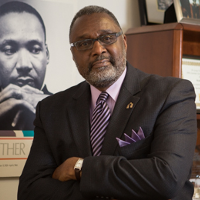 Mr. Johnson is the founder and organizer of the Office of Parent Services at The George Washington University, one of the first parent services offices in the country. With a background in coaching and athletics (including at Boston University, UNC Asheville, and GWU), Mr. Johnson has spent the last 17 years of his career helping parents, family, and caregivers be part of student success. Mr. Johnson was a star basketball player growing up in North Carolina just as the South was going through racial integration. In 1968, his talent won him a scholarship to Mars Hill University in Mars Hill, N.C., which marked the first time an African American student had received a full-ride to the school. He also made the school's Athletic Hall of Fame and received the 2013 Alumni of the Year award.